Come ride with the best! We pride ourselves on being the area's most elite instructors (STAR LEVEL 2) who have been trained by a Master Instructor. We are proud to meet the high standards to be an Official SPINNING facility since 2008! Others may try to duplicate, but nothing replaces experience. 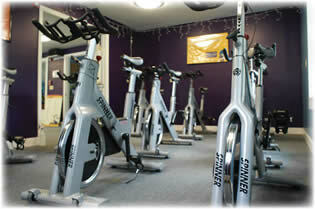 We have 10 state of the art NXT SPINNING bikes. All of our bikes are equipped with a cadence cyclometer. This combined with your heart rate monitor are just the training tools you'll need to maximize your workout and reap the benefits. Don't have a heart rate monitor? We sell Polar Heart Rate monitors, and also have a loaner program so you can try one before making the investment. Ask us! From the serious cyclists (we support Bike Coalition of Maine and have ridden the Trek Across Maine. Women's Ride 25 miles, Lobster Ride 30 & 50 miles, Dempsey Challenge 50 miles) to the person who has never been on a bike - we will help you reach your goals. punch passes can then be used to reserve your bike online. CoreSpin: 35-40 minutes of cardio followed by15 minutes of abs.Strong abs to help support the lower back, creating a stronger healthier you! 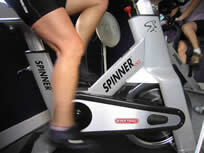 Beginner: We don't offer a beginner level as all spin classes are for all levels. It is always your ride! Talk to us if you need more information, but really, you CAN do it....come join the fun! WHAT TO BRING: If you are new to Spinning we recommend bringing a water bottle, sweat towel, and either sneakers or SPD compatible clip in bike shoes. (If you are not sure of SPD compatibility, bring sneakers as a backup). We ask that the sneakers/bike shoes NOT have been worn outside as even the tiniest grit is not good for the equipment. For your first class please arrive 5-10 minutes early to be "fit" to the bike. Heart Rate Monitors are encouraged - If you don't own a monitor and would like to try one before you buy, let us know- we have a loaner program. All classes are Co-ed, and 55 minutes in length. Classes are geared for all levels. If you are new to SPINNING, please arrive early for proper bike set up.